As worship is central to our life as a Christian community, the Chapel is at the center of our campus. Built in 1981, the Chapel of Reconciliation is home to campus ministry offices and activities. Attached to it are the offices of the South Dakota Synod ELCA and Lutherans Outdoors in South Dakota. With its liturgical art, Nordlie organ and refurbished Steinway piano, the Chapel is also an often-used space for rehearsals, performances and special events. To reserve the Chapel, please call the college's scheduling office at 605.274.4546. The Augustana Student Congregation was officially launched on Reformation Sunday in November of 1963. Sunday services as well as mid-week Lenten services were added to the daily chapel services held during the week in the college gymnasium. Years of worshipping in the gym ended on October 1, 1981, with the dedication of the Chapel of Reconciliation, the realization of a 120-year dream. Designed by Ward Whitwam Architects, the Chapel seats 567. 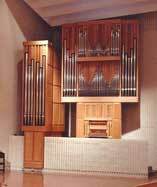 Augustana's beautiful tracker pipe organ was meticulously hand-crafted by alumnus John Nordlie, '74, owner of J.F. Nordlie Company Organ Builders of Sioux Falls. It was made possible by a gift from the late John W. and Agnes C. Siverson of Hendricks, MN, and dedicated on Sunday, December 4, 1983. The Chapel's art seeks to reflect the promise that is proclaimed and celebrated in the daily rhythms of prayer and worship in this place. Art in the Chapel was created by members of the Augustana art faculty and other regional artists. The Hovland Center for Liturgical Arts highlights these works as well as other examples of the liturgical arts in the area. 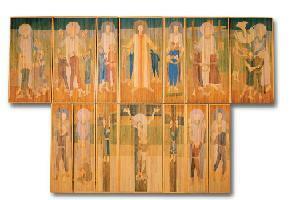 Behind the altar hangs a reredos by Robert Aldern. 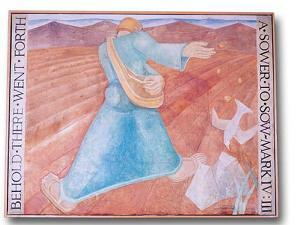 Upon entering the narthex of the Chapel, one's eyes are immediately drawn upward to “The Sower," a wall fresco created by Palmer Eide and Ogden Dalrymple in 1949. Eide's figure of Christ stands near the sanctuary doors. Eide also created the baptismal font and dove that sit at the rear of the sanctuary and designed and built the pulpit and altar for the sanctuary. 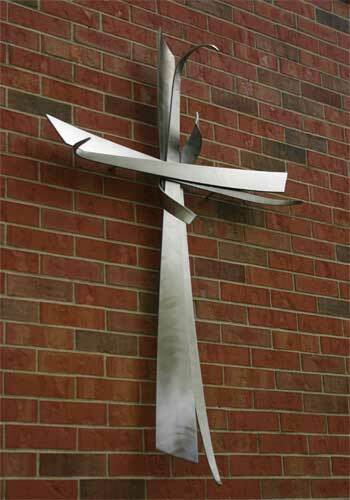 The cross on the west exterior wall of the Chapel was created by Dale Claude Lamphere. 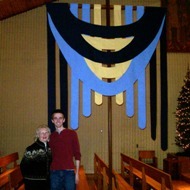 The processional banner for the Chapel of Reconciliation was designed by Brady Holm '11 and constructed by Marit Pudas.